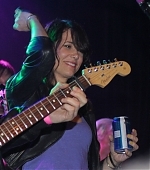 On May 25, Kristen Wiig joined Only Son for a performance of “Isis” at Dylan Fest 2012 at Irving Plaza in New York City. She did a great job singing, and the crowd really seemed to enjoy it as well. Later on, Kristen and Will Forte joined the band on stage for the grand finale of the festival, honoring Bob Dylan. Watch a clip of Kristen’s performance here, and check out a couple of pictures in our photo gallery.